For the past six years Doug has been working to create a boat. It’s the ultimate DIY project which he documents on his YouTube Channel, SV Seeker. He outsources practically nothing. Look at any portion of the boat and you’ll see his work. He even cast his own giant brass propeller. This isn’t his first vessel either. He built and launched a wooden submarine and began another sub before deciding to build a sailboat. Doug, and his girlfriend Betsy, have opened their doors to anyone who wants to come and work on the boat. Their gracious hospitality is overwhelming. There is even an apartment on the premises for people who want to stay and work a few nights in a row. Why did Doug commit his life to building this massive craft? Scientific research, believe it or not. And because he can, because the task itself is like a mountain that demands to be climbed. SV Seeker not just a sailboat. She is certainly not a yacht. She is a work boat. A dream and a tool for making dreams come true. I’ve always wanted to do something grand and daring. Something that filled my passions, not just the hours of my day or a bank account. It started with building submarines, and with confidence it became building Seeker. And when completed I will have every skill I need to keep her in shape, and she will have the strength to take us to the wonders and treasures of the worlds oceans. Seeker will cater to adventurers, explorers, oceanographers, divers, wreck hunters, marine biologists and archaeologists. If you want to be a part, then allow me to welcome you aboard. And so people from all walks of life make the pilgrimage to Tulsa to lend a hand. Some come just to see the boat in person. The first visitor arrived after driving a motor home all the way from Chicago with his family to volunteer. Doug purchased his property for just $1500. When I asked him how, he told me a story about how he smiled pretty and talked sweetly and ended up paying twice what the lady wanted for it. Since purchasing it, he made improvements including remodeling the house, building a shop and an enclosed courtyard. Doug’s life is built around the boat project. His home is modest but comfortable. Essentially, it’s one room with a bathroom and kitchen. The shop he built is actually larger than his house. Out back there’s a shed. In the front yard there’s a school bus body used for storage and, oh yeah, an enormous ocean-going sailboat. Photographs just don’t do it justice. It’s immense. My fascination with the project began a couple years ago when I saw my first SV Seeker video. 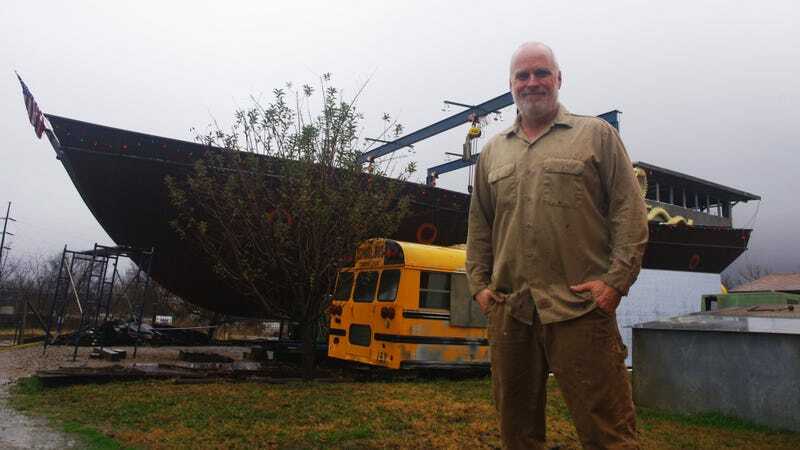 I saw a guy, Doug, welding together enormous sheets of quarter-inch steel plate to create the hull of a boat that would be more than 70 feet long when completed. Building a boat of this magnitude on your own is a feat most people wouldn’t even consider possible. Since then I’ve followed the progress of the boat as Doug published each new episode. I set out to find out what makes Doug tick. I contacted him to arrange a weekend to come up and work on the boat and then made the four-hour trek to Tulsa. Once there, I made my way through town and took a left down a sedate street. As I did I caught my first glimpse of the boat looming up from behind the other homes. I saw a pair of huge gantries more suited to a dockyard than a residential neighborhood. 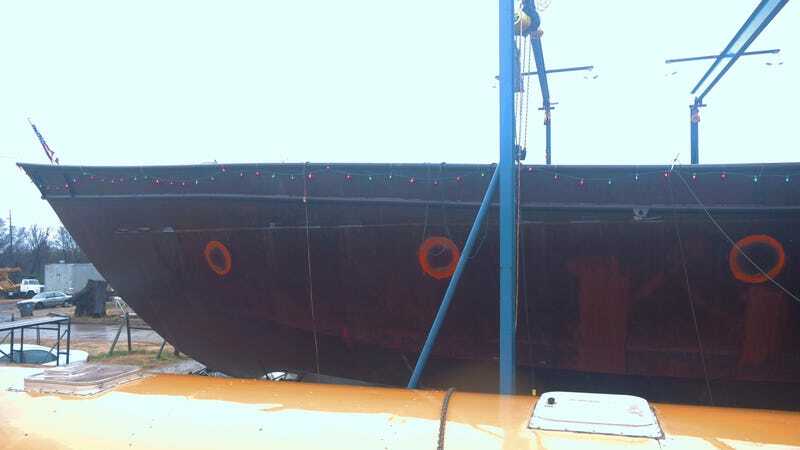 And nestled beneath them is the SV Seeker, a hulking, rusty hulk adorned with twinkling Christmas lights. Upon entering the gate and a thorough sniffing by the dogs, I was dwarfed by the bow towering above me, completely dominating the front yard of Doug’s home. I was giddy with excitement. It was so surreal to finally see the boat in person. Not simply because I’d only seen it on YouTube, but because it’s a towering boat planted in the middle of a neighborhood. That’s a full-size school bus sitting next to the boat. I unceremoniously hustled up the aluminum ladder and immediately went to work with a pneumatic impact wrench in the belly of the boat. We were bolting down a hatch to prevent the rain from falling in. It wasn’t long before I was stuffed to capacity with pizza and Buffalo wings. Then it was back to work. The rest of the weekend was spent working and talking with Doug. We welded and did a lot of grinding on deck. You can see his video featuring yours truly here. When Sunday rolled around and we sat down for a formal interview, I found most of my questions were already answered. I asked how he has stayed so committed to one goal for so long. He said that within the span of your life you can build huge things if you’ll only commit to them. But how do you stay so committed? When I asked him whether he ever considers not finishing the boat, his short answer was no. Doug describes his project as “the boat the Internet built.” There’s a whole community of people online who want to see him succeed. With such a big project there is always something to do whether it’s welding, grinding, or preparing to cast port lids. Orchestrating such a big build must be a feat in planning and organization, right? Well, to a degree it is, but mostly Doug allows the project dictate what happens next. He lets it happen organically. He tried to make a list once but he never went back to look at it. You can’t make a steering wheel until you’ve made the rudder and all the pieces in between and you can’t fill your keels with lead until you’ve made them. This seems to be the way Doug is living his life. He forges ahead based on what knowledge is available now, and just has faith the answers will become clear the closer he gets to them. Building the boat has convinced him that people worry unnecessarily. Making an excuse, or thinking of a reason not to do something, is easier than taking action. Doug watches no TV; he doesn’t read the newspaper and he preferred conversation to radio while we were riding in the car. Doug suffers from dyslexia, which makes reading long texts difficult. And in the late 1980s, he found out he had a heart murmur after joining the Army. If Doug allowed himself to use these setbacks as excuses, he never would have picked up a welder to begin this project. Even though the boat seems like a monument to a singular vision, Doug says his end goal is flexible. He doesn’t see the end of his project as merely completing the sailboat. He wants to provide a platform for conducting marine research for little or no cost. He isn’t just building a boat. He’s building a career for himself and he’s building opportunities for researchers who may not have the opportunity to go to sea otherwise. There’s a picture on the wall in his house that says, “wear your passion.” I guess that explains the rather large tattoo of his boat on his forearm. What makes Doug tick? The best I can come up with is that he possesses an irrepressible desire to eliminate excuses and fears that would otherwise control him and keep him from achieving his goal. He’s not scared to dream big. I see Doug as a guy who chose live by his own rules. He isn’t grasping for that next rung. He’s not trying like hell to move up into the next social class, or give the appearance of having money. He has liberated himself from all that, and by doing so has aligned his priorities in a way that seems totally uncommon. He hopes his build will inspire more people to take on projects of a similar magnitude. What he does have in indefatigable faith in himself to complete his goals. He has chosen to define his own criteria for success. SV Seeker is a concrete manifestation of one man’s will, a man who has taken the helm of his life firmly in both hands and stayed the course, whatever storms may come be damned. Two years ago Aaron Vick Starnes quit his well-paying bank job to grind it out as an automotive writer. He has experience in automotive restoration, and works at a shop restoring and customizing cars. Follow him on Twitter at @AaronVStarnes and check out his blog.